The war in Chechnya is a very complicated political occurrence. Numerous concepts and principles of the end of the 20th century, such as territorial integrity, the right of self-determination, diversity and security all clashed with each other on the battlefields of this small country and in the offices of governments and international organizations. It would hardly be an exaggeration to say that the war in Chechnya is one of the “dirty imperialist wars” of the post-world-war world that was “successfully” pulled into the new millennium. 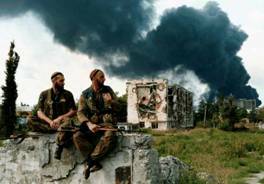 This article and site have been created to help everyone who is interested in international politics to understand some of the background to this war and to learn more about Chechnya, its history, culture and people. All texts are Copyright protected and may not be reproduced without the permission of the author.